Taxidermy animals in a den. - Describe this setting! 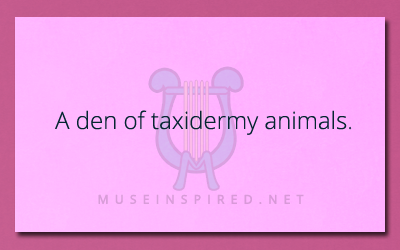 Describe the Setting – A den of taxidermy animals. You have walked in to a den of taxidermy animals. What do you see? A den of taxidermy animals. It invokes an instant image in your brain. Describe this setting with as much detail as you can muster. This could be a hunter’s lodge deep in a fantasy world’s forest, or the very strange garage of someone’s modern day house. Could you imagine the kind of creatures one might find in a space station’s taxidermy shop? If you’re not familiar with the basics of taxidermy, the wikipedia has just what you need. Describe the Setting - A school on the moon. Describe the Setting - A weird relative's bedroom. Siring Settings - The one restaurant in town that everyone wants reservations to.